From traditional hand castings, to the use of 21st Century materials creating modern and dynamic spaces, ASF Street Furniture captures and reflects the environment it inhabits. Using the latest recycling and manufacturing techniques, ASF's range of recycled plastic products encapsulate the environmental benefits of recycled plastic with the practical qualities of a material that will not rot, splinter or rust. 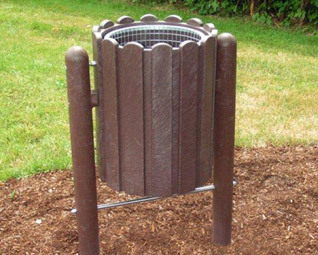 Available in a wide range of standard styles and sizes - ASF recycled plastic bollards, picnic tables, seating, planters, post & rail and litterbins are suitable for a wide range of uses. 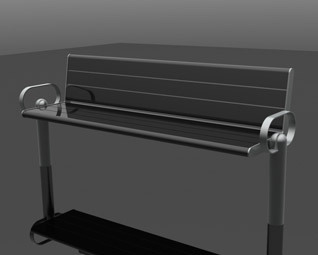 As with all products, ASF can manufacture completely bespoke recycled plastic street furniture if required. Recycled plastic has a great deal of flexibility not offered by other materials. Rather than being painted, it is pigment dyed throughout meaning small scratches and areas of damage do not visually detract from the product. 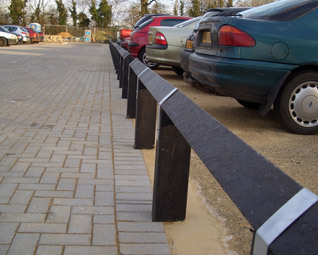 The light weight is a great advantage if removable or semi-permanent products are required, and the smaller sizes of post profiles make for a genuine budget range where simple post demarcation is the main requirement. As well as standard range and fully bespoke items, ASF can take the standard products and adapt them to meet individual site needs. 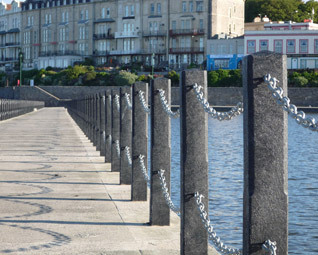 Increasing strength of bollards with the addition of inner steel bars, adding eyes to products for chain attachments or leaving holes to house railings and bars are all possible. Products are manufactured in standard dimensions which reflects the tooling required during the development stages, but ASF can also offer a wider range of sizes and dimensions to all products and produce completely new tools if required. Manufactured entirely from environmentally impeccable hydrocarbons. With an expected lifespan in excess of 40 years these products are manufactured from waste streams such as bottle caps, bottle crates and pre-used agricultural film and once processed are strong enough to be made into structures as strength critical as bridges and landing platforms. 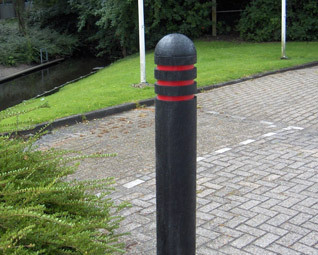 ASF recycled plastic bollards come as standard in round and square sections with a variety of bollard top and visibility band options. 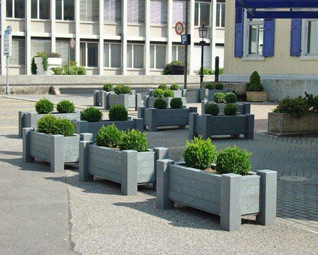 In addition to this ASF can manufacture recycled plastic bollards in octagonal section and as decorative moulds, similar to those bollards manufactured in cast iron. 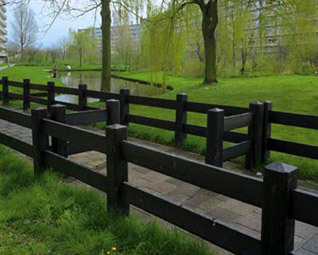 ASF have a range of birds-mouth and estate style recycled plastic fencing. 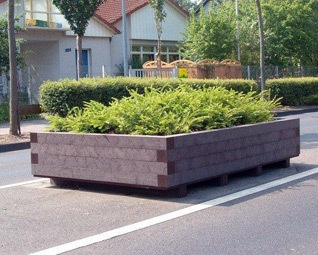 This offers an environmentally friendly and good value alternative to other traditional materials. ASF can also offer recycled plastic in a range of post profiles and plank sizes (including tongue and groove) if a more traditional 'carpenter style' site build is required. 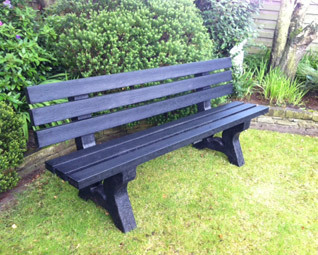 Recycled plastic can be worked in much the same way as timber for these purposes. Seating is one of the key elements of any public space development. 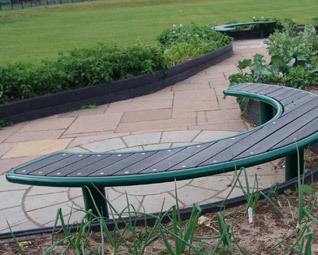 ASF have a range of benches and seats to suit a wide variety of needs. 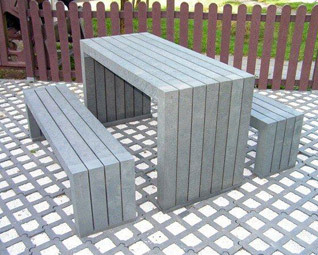 100% recycled plastic seating offers a direct alternative to materials such as steel, stainless steel, iron and timber, but the plastic itself can also be used in conjunction with other materials to create a striking look and get the best out of all the different elements. ASF have a range of products which already do this as well as the ability to manufacture on a bespoke basis. 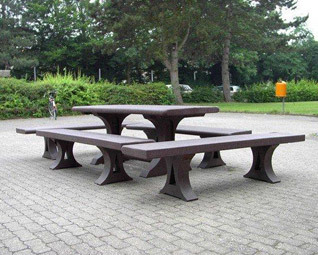 Supplied as either complete units or by combining existing seat / bench designs with a recycled plastic table, ASF's recycled plastic picnic tables offer a great diversity of style when something that little bit different is wanted. 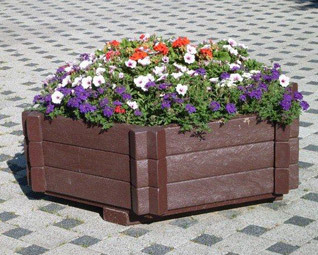 The single most impressive thing about manufacturing planters from recycled plastic is that unlike any other material they simply will not rot or rust and require no additional processes (galvanising, coating, varnishing etc) to achieve this rot proof state. 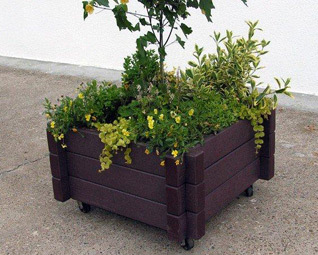 As such, recycled plastic is perhaps the most practical material to use when manufacturing a planter. 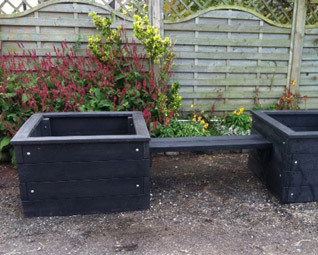 ASF have a small standard range of planters and have extended this by developing planter/seating combination units - a great way to kill two birds with one stone whilst enhancing the physical environment. In the age of recycling, it makes sense that there should be an option for the receptacle that houses litter to also be recycled. Click here to view drawings of complete ranges.